Thursday was a cold but beautiful day in Boston. After Angela's appointment, Guillaume picked her up (in the car!) so that they could go to Target (Americans pronounce it with a French accent). Target is a store that has everything in the world in it. Guillaume got some pens for work, and they got some beautiful Christmas decorations for their tree. Target is also a store where one goes to buy something, and walks out with a LOT more. Guillaume also picked up the movie Ratatouille on DVD. The afternoon was spent on the couch watching Ratatouille. Angela laughed out loud. But they both felt a little icky with ALL the rats at the same time in the movie (particularly with a potential mouse under their stove). It did make Angela hungry for some cheese. After the movie, Guillaume and Angela walked to the Boston Garden on Thursday evening to go see the Boston Bruins hockey game. They were playing the Montreal Canadiens. Sadly, we walked out of the Pro Shop with nothing. We found our seats, which were VERY good. Before the game, the players for both teams come onto the ice to skate around and "warm up". Two women were right in front of us (though their seats were somewhere else) trying to get the Montreal teams' attention. They tried for a long time. They banged on the plexiglass, and held up little signs. The National Anthems for both Canada and America were played. The man in the picture below, on the right, seems to be praying that someone won't take his beer away. The game was pretty exciting - it goes VERY fast! Sometimes, the hockey players get into fights. It was scary when one of the players got hurt and didn't move for a few minutes. He ended up skating off the ice, so we think he was okay. After the game was over, the place cleared out pretty quickly. The Bruins lost. Oh well. We can't have it all here in Boston! It's Friday evening now, and Guillaume is going to cook DUCK tonight for dinner! Hooray! I WAS WITH YOU WHEN YOU BOUGHT THAT SWEATER!!!! p.s. I am scared of the rats, too. I almost bought the movie tonight at Target, but instead, I bought a new overnight rolly, some air (to clean my puter keyboard), some Kissables because I have to make cookies for my mom's retirement par-tay tomorrow, and John Frieda hair stuff. Not much of a sports fan, but I want to know, how was the duck?!!! But i was very happy to see a picture with Mr and Ms Rousseau..
We know hockey is a fast and dangerous game, does'n't it Nico?? As Helen, i want to know how was the duck..cooked by Guillaume?? Hello to all our american family.. It was a little bit a "french victory " for the game between Montreal and Boston because the canadian's netminder is french : Christobal Huet ! Very happy to see hockey picture but I would prefer being there. 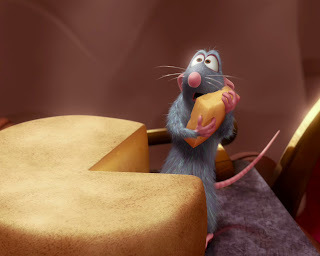 I watched Ratatouille in France at the cinema it was very good even if a little children close to me was scared and crying because of the rats ! I imagine that you laughted a lot. Nico paid really attention about your pictures !!! He really misses hockey .